Therapy Hair Studio > Blog > Therapy Hair Studio > Color Correction by Kelsey Champion that you’ve got to see! Color Correction by Kelsey Champion that you’ve got to see! 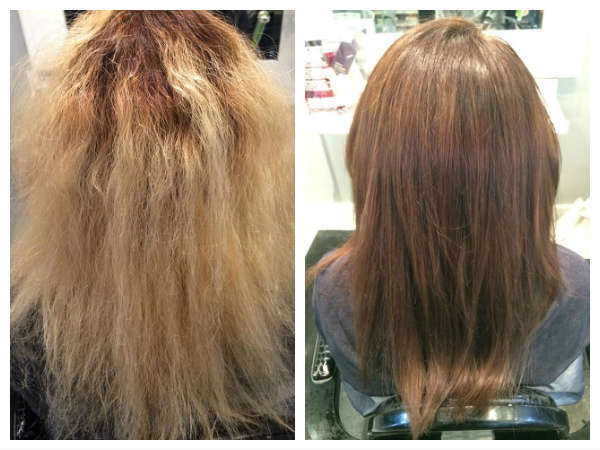 Check out this amazing hair transformation done by Therapy stylist, Kelsey Champion. The client pictured below came in a few days after a terrible attempt at Ombre’ by another Houston Hair Salon. As you can see, she didn’t get the results that she was looking for and came to us for help. Color correction can be very tricky because you’ve got to figure out the steps to achieve a natural color using the least amount of harsh processing to avoid any additional damage. So in this case, to achieve a natural color, Kelsey chose to take her hair darker to preserve the integrity of her hair but she left some of the lighter strands of hair untouched to add dimension and act as highlights. All we can say is don’t try this at home. This technique is best left to, not just a professional stylist but one who is trained in the art of color correction. Therapy hair stylists train extensively on color and color correction. Call 713.355.HAIR to book an appointment with one of our color specialists.